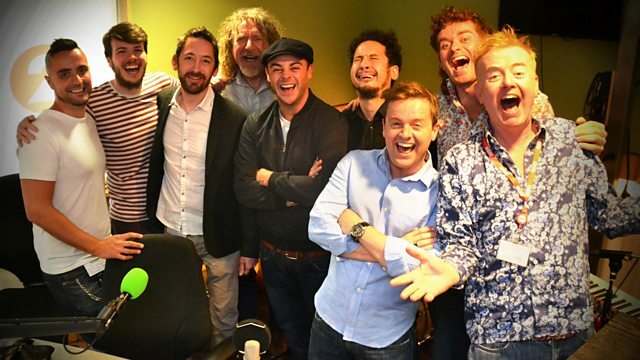 Chris gets that Friday feeling going with Robert Plant, Ant and Dec, and Mamas Gun, who play live in the studio. Chris gets that Friday feeling going with Rock royalty and Led Zep legend Robert Plant, who is talking about his new album Lullaby and The Ceaseless Roar, Ant & Dec pop by ahead of their Saturday Night Takeaway tour and there's live music from Mamas Gun, whose latest song Red Cassette we've been playing and loving! Richard considers the symbolic significance that can be found in flags. The Hits Of 1964 (Various Artists). Heartbeat - The 60's Gold Collection. Sultans Of Swing - Best Of Dire Straits. The Best Of John Barry: Themeology. Television's Greatest Hits Volume 3 70s & 80s. T. Rex - The Singles As & Bs. The Hits Of 1961 (Various Artists). Great place for a vexillologist, I thought as I roamed the streets of Glasgow last week. As you know, a vexillologist is a student of flags, but you would have to be a very diligent one to recognise more than one in twelve of the contesting nations in the Commonwealth Games. I say nations, I’m not sure the Bailiwick of Guernsey can quite claim an equal space on the world’s stage with, say, India, but who am I to rain on their tiny parade? Some flags do the job with admirable economy. The red maple leaf of Canada, for example, should win a prize for clarity; Tonga’s use of the Red Cross’s symbol needs a little explanation; but we should tread carefully, for flags are not only identifiers, they are symbols of a nation’s hopes and aspirations. Who hasn’t been moved by the tears of contestants from tiny places as they watch from the podium their flags hoisted high? On Sunday evening another flag will be hoisted high in my church, the standard of the Royal Anglian Regiment Association. A hundred years after first exchange of fire in the First World War we will remember all those who died for king and country, 133 of them from my parish. Some of their banners are now very tatty indeed, faded with age, fretted by shot and shell, telling not of the heights of human achievement, but the depths of human savagery. Not that we needed much reminding of that in the last few weeks. So what are they doing in church? To seek a blessing on human savagery would be beyond blasphemy, but that’s not why they’re here at all; they’re here to be laid down at the threshold of another country, a place without a flag or an army or a national squad, a place where the Prince of Peace prevails, and where war and suffering and strife is done for good. After eight years of hosting the Breakfast Show, Chris Evans leaves Radio 2. BBC Radio 2's story-writing competition for kids.